LAST summer, David Fishelson was searching for plays that his new company, the Manhattan Ensemble Theater, might stage in 2002. He came upon H. Leivick's Yiddish classic, "The Golem," while newspapers and television news were rife with reports of the escalating Palestinian intifada and of Israel's military response to it. "The Golem" seemed painfully apt: its central concern is the self-destructive consequence of Jews resorting to violence to defend themselves. So Mr. Fishelson decided he would adapt an English translation of "The Golem" for the theater's first full season of presenting literary works. Now it's about to open, on Thursday, directed by Lawrence Sacharow, and the timing remains apt, perhaps even more so. This 81-year-old drama of a fearsome Jewish avenger arrives on the theater's SoHo stage against a backdrop of heightened carnage, terrorism and war in Israel, the West Bank and the Gaza Strip. Pinned on the wall of the theater's basement rehearsal room is a clipping from last month's news pages. "For Israelis, New Tragedy Is a Challenge Sent by God" a March 4 headline in The New York Times reads. The article reports that after a suicide bombing had killed nine people, some ultra-Orthodox Jews in Jerusalem called on Jews to renew their faith in God and intensify their religious observance. Someone had highlighted a quotation in the article in yellow ink. "Tanks won't help," it reads � the words of an Israeli man. "We just have to cry out to God to bring the Messiah." To Mr. Fishelson, the Manhattan Ensemble Theater's artistic director, the line echoed one of the themes of Leivick's play. Set in Prague in the 16th century on the eve of Passover, "The Golem" is based on Yiddish legends of mystical powers and supernatural beings. It tells the story of a rabbi (Robert Prosky plays the role in the current production) who breathes life into a clay figure (Joseph McKenna portrays the title character) to create a rescuer for a beleaguered Jewish community. This golem � mighty, invincible, able to bring people to their knees with just his icy stare � has the mission of avenging Jews against the anti-Semitic slurs and assaults of the surrounding community, particularly as Passover approaches and Christian extremists accuse Jews of ritually slaughtering gentile babies and using their blood to make matzo. The golem wreaks fierce retribution and the Jews proclaim him a hero. But he gets carried away. He goes on a rampage, spilling the blood of those he was meant to protect. Mr. Fishelson is hardly the first producer to find uncanny relevance in Leivick's abstract drama. From its first production in Moscow in 1924 until today, "The Golem" has been regarded as a play that speaks to burning contemporary issues. The Habima Theater troupe, which presented the premiere in Moscow (though it was written in New York), saw the play as an allegory addressing their own dilemma in newly Soviet Russia: Was the revolution a promising new beginning or an apocalypse? Had the Bolsheviks created a monster? Sixty years later, the Nobel Prize-winning Yiddish writer Isaac Bashevis Singer considered "The Golem" on the occasion of a production directed by Richard Foreman for the New York Shakespeare Festival. The play, Singer wrote in The Times, is "a myth for our time." "I am not exaggerating when I say that the golem story appears less obsolete today than it seemed 100 years ago," he declared. "What are computers and robots of our time if not golems?" More urgently, Singer compared the golem to the nuclear arms race. "While we attempt to surpass our enemies and to create new and more destructive golems, the awful possibility is lurking that they may develop a volition of their own, become spiteful, treacherous, mad golems." It would probably have pleased Leivick to know that the work he called "a dramatic poem in eight scenes" found such resonance in a range of contexts. After all, he was part of the generation of Yiddish writers that sought to universalize the literature of Eastern European Jews. Though "The Golem" is steeped in Jewish legend and practice, and concerned with the religious theme of exile and redemption, stylistically it borrows from such modernist experiments of the post-World War I period as Symbolism and Expressionism. More than that, the Jewish masses in "The Golem" are portrayed as suffering innocents � any suffering innocents � who await salvation and turn the other cheek. Born in White Russia in 1888 as Leivick Halpern (he changed his name in America to avoid being confused with the Yiddish poet Moyshe-Leyb Halpern), Leivick received a traditional Jewish education in a yeshiva. As a teenager he joined the Bund � the Jewish democratic-socialist mass movement that fought for the expansion of Yiddish culture and for the defeat of the czar � and in 1906 he was arrested and sentenced to four years of forced labor, followed by exile in Siberia. With the help of comrades, he managed to escape from Siberia. After journeying by foot across the frozen tundra, he sailed for America in 1913. Leivick's poems about spirit triumphing over physical enslavement had preceded him to America, and he was received as a hero in his new homeland, where his work enjoyed immense popularity beyond his death in 1962. Laboring as a wallpaper hanger � and always a proud proletarian � he fell in with the group of writers who, calling themselves "The Young Ones," self-consciously sought to create a new Yiddish literature in and for the new land. But in contrast to the first generation of American-Yiddish authors, these writers exalted poetry for its lyricism and mystery more than for its usefulness to radical politics. Nevertheless, "The Young Ones" came from leftist movements like the Bund and their work could not help but mix their passion for evoking mood or exploring form with concrete worldly concerns. In the same year that "The Golem" was published � 1921 � Leivick's play "Shmates" ("Rags") was produced at New York's Yiddish Art Theater, depicting a struggle among sweatshop workers over whether to strike for a few extra pennies. His next play, "Shop," also draws a portrait of the degradation of Lower East Side laborers; like "The Golem," it asks whether ends justify means, and considers what happens when noble ideals are perverted by ignoble efforts to achieve them. Certainly, Leivick raised that question about the Soviet Union. He stopped writing for the Yiddish Communist papers in 1929, when the party supported a violent Arab uprising against Zionist settlers in Palestine. With the Stalin-Hitler pact of 1939, he broke off all relations with the left. Still, as one of "The Young Ones," Leivick probably would have appreciated the way some artists in the current generation of American Jews have turned to works like his as they join in the timeless Jewish preoccupation of searching for a usable past. Michael Chabon's celebrated novel "The Amazing Adventures of Kavalier & Clay" is only the most recent example. The legend of the Prague golem provides an inspiring image of deliverance for the novel's heroes, one of whom flees Nazi-occupied Prague after helping to hide the ancient golem's remains from German anthropologists. In Brooklyn, he joins up with his cousin  evocatively named Clay  to produce heroic comic books with daring tales of escape. 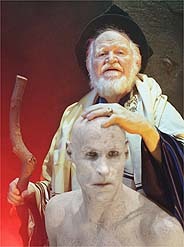 If the play seems especially vital now, it is not only because some Jews continue to yearn for messianic redemption. It is also because the current generation has a different relationship with the idea of Jewish power than their grandparents, and thus the ability to consider the play's challenging themes anew. A century ago, the fantasy of a brawny and indestructible protector provided a compelling answer to Jewish vulnerability  even beyond the realm of the theater. Most famously, perhaps, the early Zionist leader Max Nordau called for a "Muscle Jew" to rise up in place of the stooped and feeble Jewish men of the shtetl. But American Jews in the 21st century live for the most part in comfort and security, without fear of pogroms or blood libels. Scholars and writers of this generation  for instance, the political essayist Melanie Kaye/Kantrowitz or the postmodern Talmudist Daniel Boyarin  have been able to step back from the earlier need for a "Muscle Jew" and question the consequences of that course, and even whether it was the only option. It's impossible to look at "The Golem" today without bringing the full range of such critical insights to the drama. While Israelis, on the other hand, exist amid ever-mounting fears of attack, any effort to find an analogy in "The Golem" to the current situation requires one to notice that, unlike the Jew-haters of 16th-century Prague, the Palestinians have expressed genuine grievances. Taking the logic further, one confronts the most troubling question that some Israelis and American Jews are beginning to raise: Has the militarily mighty Jewish state become a golem for the 21st century, promising protection but leading to peril? Alisa Solomon, a professor of English and theater at CUNY, has reported on the Palestinian and Israeli conflict for The Village Voice, where she is a staff writer.